Three members of a Southern California-based white supremacist group face federal conspiracy charges in attacks on counter-protesters at political events across the country, including the rally that turned deadly in Charlottesville, Virginia, prosecutors said Wednesday. Robert Boman, 25, of Torrance, Tyler Laube, 22, of Redondo Beach, and Robert Paul Rundo, 28, of Huntington Beach, were arrested without incident early Wednesday in the South Bay area of Los Angeles County. A fourth suspect, Aaron Eason, 38, of the Riverside County community of Anza, was being sought, officials said. 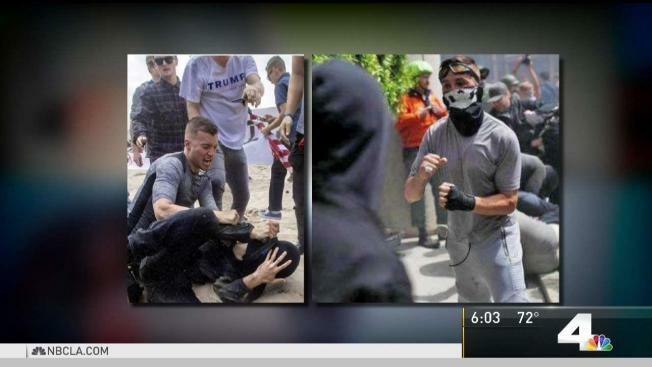 The suspects are accused of sparking violence in Berkeley, Huntington Beach, San Bernardino and Virginia in 2017, according to a federal criminal complaint. "Every American has a right to peacefully organize, march and protest in support of their beliefs – but no one has the right to violently assault their political opponents," said U.S. Attorney Nick Hanna in a statement. "The allegations describe an orchestrated effort to squelch free speech as members of the conspiracy travelled to multiple locations to attack those who hold different views. This case demonstrates our commitment to preserve and protect the freedoms guaranteed by the Constitution." Rundo's attorney denied allegations that his client was leading RAM or that he was involved in a pattern of "escalating" violence. The men are accused of going online and coordinating combat training to prepare for the events, arranging travel, and celebrating their actions to recruit members for future events, court documents said. RAM was formed in the winter of 2016-2017 by several founding members, including Rundo and Ben Daley, who was named in another federal indictment earlier this month, prosecutors said. This spring, Rundo allegedly traveled with Daley to Germany, Ukraine, and Italy to celebrate Adolf Hitler's birthday April 20 and meet with members of European white supremacy extremist groups, court documents said. RAM represents itself, through videos and other public online posts, as a combat-ready, militant group of a new nationalist white supremacy/identity movement, prosecutors said. Rundo, Boman and Laube appear in several of videos and photos. In one, Rundo is shown training with Daley above the words "WHITE UNITY," authorities said in court documents. Rundo also appears front and center posing in a skeleton mask with other members of the group, court documents said. The case is connected to one earlier this month that charges four other California RAM members with violent fights at a torch-lit march at the University of Virginia and Unite the Right Rally in August 2017. The four defendants were identified as Daley, 25, of Redondo Beach, Thomas Walter Gillen, 24, of Redondo Beach, Michael Paul Miselis, 29, of Lawndale, and Cole Evan White, 24, of Clayton, California. At Wednesday's detention hearing, Rundo's attorney, Julia Deixler, argued that her client deserves to be released pending trial due to his "stable lifestyle," abstinence from drugs and alcohol, and the fact that he holds a steady job. However, Assistant U.S. Attorney David Ryan told U.S. Magistrate Judge Karen Stevenson that the defendant has engaged in violence in support of a neo-Nazi ideology, poses a threat to the community and is likely to flee if released. Rundo, Ryan argued, represents a "combat-ready militant arm of the white supremacist movement." The prosecutor added that Rundo is tattooed with images of Hitler, traveled to Germany in the spring to celebrate the Nazi leader's birthday and has shown "an ongoing devotion to the use of violence."